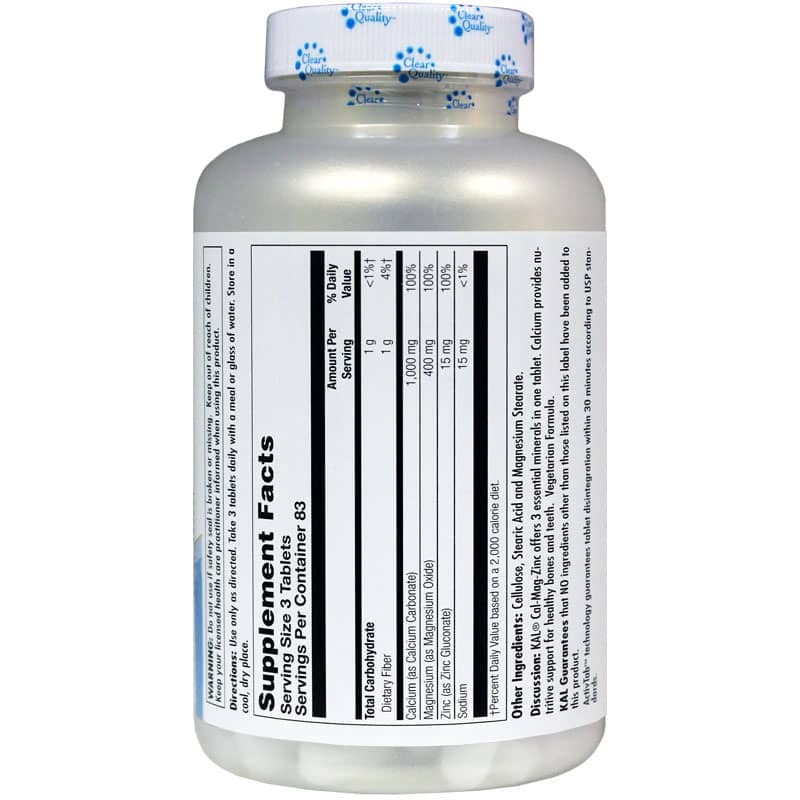 Get three of the most important essential minerals for bone and dental health combined into one high-potency supplement. It's no secret that calcium is required for strong bones and teeth. But calcium also needs some assistance from other minerals. Magnesium helps convert Vitamin D (another important bone health nutrient) into its active form. We need Vitamin D for optimal absorption of calcium. Zinc is essential for proper growth and maintenance in the body. It may help people with weak bones or low bone mass, and could even help some people avoid bone loss. 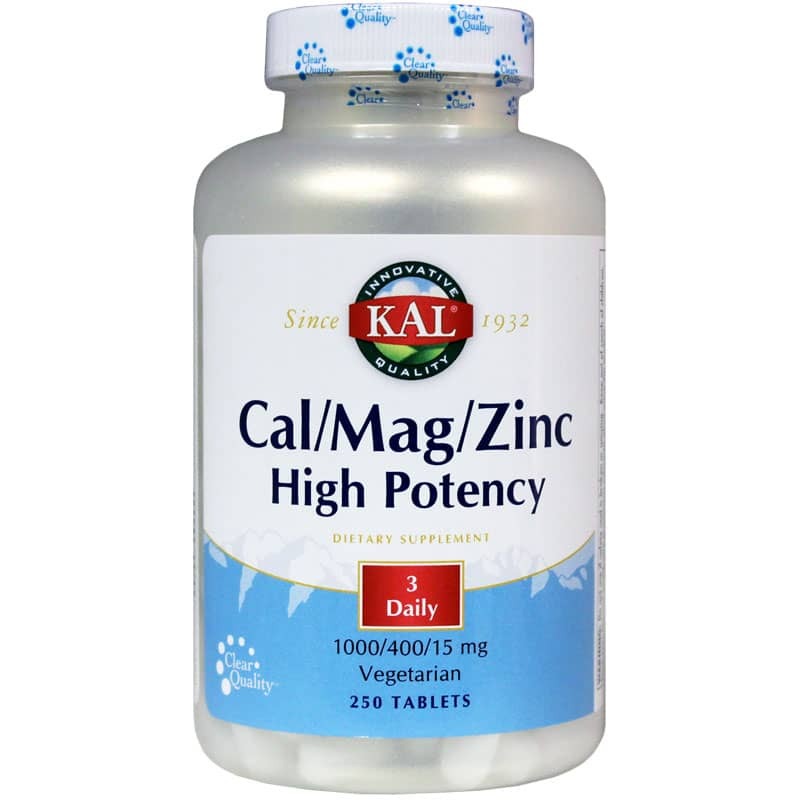 Cal/Mag/Zinc from Kal offers all three of these essential minerals in one tablet. The ActivTab technology used to create these tablets guarantees disintegration within 30 minutes according to USP standards. That means your body can absorb those beneficial minerals before they simply pass through your system. Support every bone in your body with the minerals it needs. Order Cal/Mag/Zinc from Kal today! Adults: Take 3 tablets daily with a meal or glass of water. Store in a cool, dry place. Natural Healthy Concepts offers so much.... while I have place several orders with them, it is always difficult to say what exactly I notice from a product - especially the Cal/Mag.... I take it as it has been suggested to me by a chiropractor! Quality Customer Care; Quality Service; Quality Product; What more can we say? Great Prices too!!! They really CARE ~ XOXOXOXOXO them!! !